A pen and ink and wash drawing on blue paper of a stormy landscape scene. A village in the background; trees are buffeted by a storm and a herdsman tries to control his terrified animals. Initially working as a stage designer Marco Ricci returned to Venice from England in 1716 and began making many landscape drawings and paintings. Blue paper was regularly used by earlier Venetian artists. 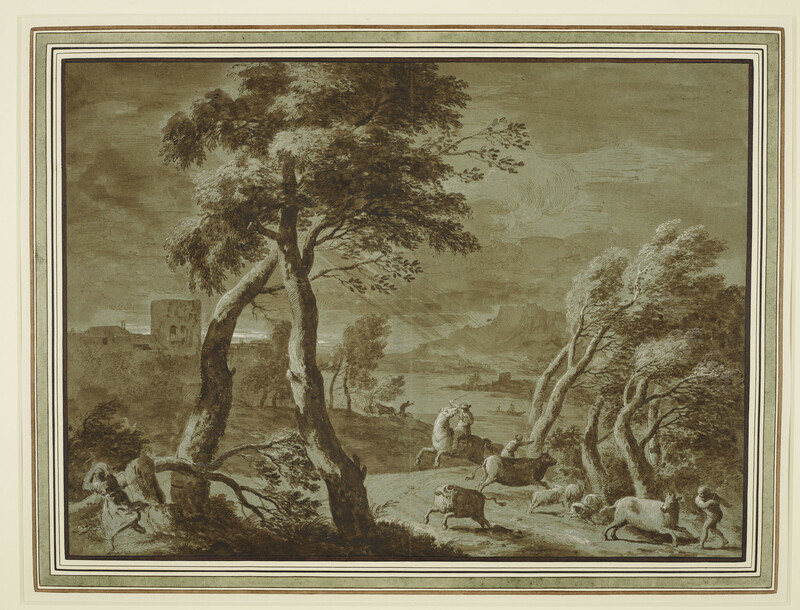 On 22 April 1727 Ricci wrote to Francesco Gabburri in Florence that 'today I got hold of a certain bluish tinted paper on which I want to make two drawings in watercolour heightened with white...'.He made use of the mid-tone paper to explore the depiction of atmospheric effects, allowing both darker ink and white highlights to be added. Joseph Smith owned 146 landscape drawings by Marco Ricci; Anton Maria Zanetti had 141 drawings in an album now dispersed. A similar composition in tempera on leather is RCIN 400577.